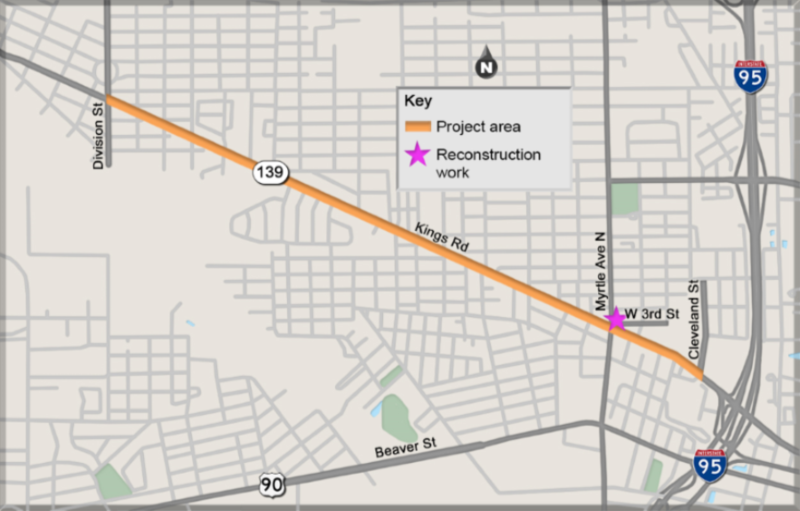 The Florida Department of Transportation (FDOT) is scheduled to begin traffic signal updates on State Road 139/Kings Road from Cleveland Street to Division Street this May. 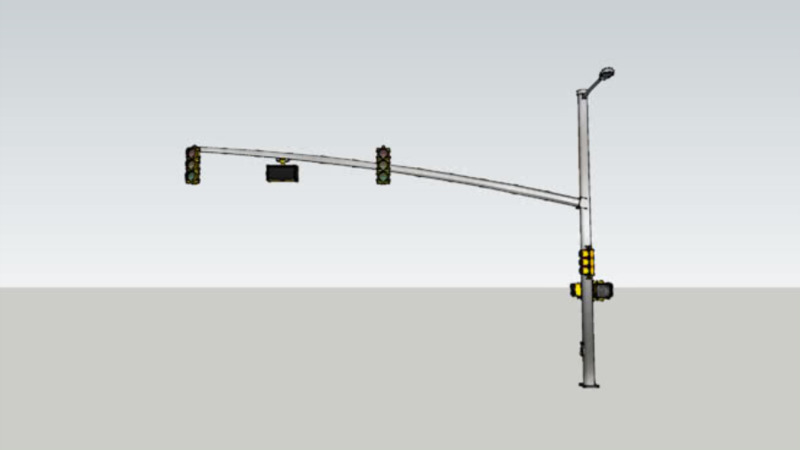 Traffic signals will be upgraded from existing strain poles to mast arms at the following intersections: Cleveland Street, Eaverson Street, Myrtle Avenue, Tyler Street, Fairfax Street, Spires Avenue, Kings Park Drive, Canal Street, and Division Street. To improve safety and address sight distance concerns, the City of Jacksonville has requested FDOT to reconstruct the West 3rd Street and North Myrtle Avenue intersection. The reconstructive work at West 3rd Street and North Myrtle Avenue will include permanently closing the intersection, building a cul-de-sac and sidewalk , curb and gutter. Other construction work in this project will include updating pedestrian signals, street signs, sidewalk repairs, curb and gutter work and other incidental construction items. Single lane closures are allowed from 6 p.m. to 6 a.m. Monday through Sunday. Double lane closures are allowed 9 p.m. to 5 a.m. Monday through Sunday. No lane closures will be allowed 30 minutes before school start and dismissal times of John E. Ford School at Cleveland Street. James D. Hinson Electrical Contracting Co. Inc., was selected to complete the project in 420 calendar days, weather and unforeseen circumstances permitting. An informal open house for this project is scheduled Monday, March 25 from 4:30 to 6:30 p.m. at the FDOT Training Building, 2198 Edison Avenue Jacksonville, Florida 32204. Those interested in learning more information about the traffic signal improvement project are encouraged to attend. Project team members and FDOT staff will be available to answer questions, discuss traffic impacts and construction activities.